Animation has moved to the center of our moving-image culture. America’s children spend more time engaging anime and avatars than they watch network TV. Animated formats compete with main line cinema, and new media artists commonly utilize and manipulate animation processes in their projects. A proliferation of easy to use animation software such as Flash has introduced animation to artists. Digital animation processes now used by artists encompasses a fast array of approaches, from simple tools to industrial software used to create the latest Pixar blockbuster. 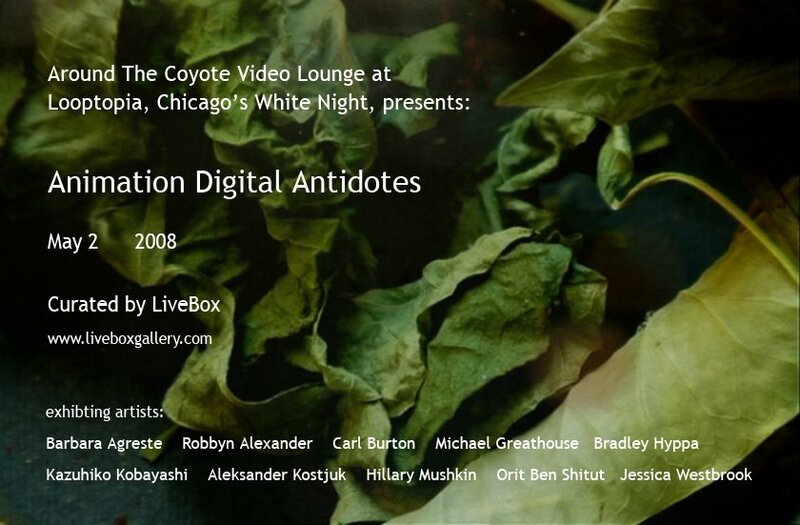 Digital Antidotes is a selection of video art that is digitally animated. Abstract rhythms emerge from music, line and shapes. These artists use generative video loops to create dynamic imagery, some reminiscent of the great Oscar Fischinger. Bradley Hyppa, USA, “Lunchtime in the Fidi”, generative video loop, 2007, (3:53 min). Pedestrian movement across the urban landscape is captured by video taken from the 14th floor above the Financial District in San Francisco. These rhythms are used to create abstract computer generated renderings (using the open source Processing platform) to provide insight into both the objectives and methods of social construction. Collection of generative looped videos. Rhythm and line merge to create audio and video music. Exciting contemporary animation that references methods used at least a century before cinema, such as stop action and puppetry, but enhanced through new animation tools. Barbara Agreste, Robbyn Alexander, Carl Burton, Michael Greathouse, Bradley Hyppa, Kazuhiko Kobayashi, Aleksander Kostjuk, Hillary Mushkin, Orit Ben Shitut, Jessica Westbrook.